C.Y.K.C. is committed to providing the community outreach to males and females of all ages. C.Y.K.C. places special emphasis toward keeping youth on a positive path in life by stressing the Martial Arts Philosophies with such Virtues as self confidence, motivation, discipline and restraint. Hugo M. Rojas (right) C.Y.K.C. Founder/Pres. honors Joe Alegria (left) V.P. 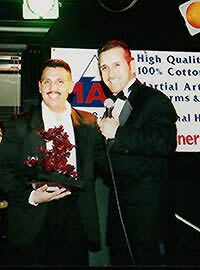 C.Y.K.C., tournament & celebrity event stage coordinator for his many years of dedication and community service, to children of the martial arts throughout Southern California. C.Y.K.C. 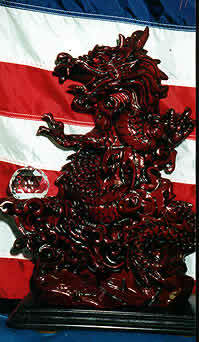 discourages the use of drugs as being wholly inconsistent with the teaching of the Martial Arts. Principles of physical fitness and health are taught to all students. Non-violence is stressed above all things. Students are taught to avoid physical conflict, unless involved in a life threatening situation. From our experience the motivation, discipline and self-confidence taught to students transfers directly to their school environment. Click on the image to see a short video of Hugo Rojas giving a grand performance at the All American Black Belt Championships UC Santa Barbara, and recognized by film star Cynthia Rothrock, Grand Master Al Thomas televised on ESPN 2 summer of '98. Martial Arts requires consistency and commitment that has to come from within ones self. All children are blessed with some type of consistency in their life either at home or school. We take what that child already has and enrich it with consistent positive support from their peers, training and motivation. We provide that other family youngsters with a positive family environment rather then the negative, such as "Gangs". Youth gangs provide the same need to that child: i.e. support from their peers, motivation and understanding (another family). C.Y.K.C provides all this in a consistent positive way.C.K.Y.C helps that child learn and develop goal setting and teaches that child how to master those techniques. California Youth Karate Club, Inc.'s self-defense and safety awareness programs are open to all regardless of race, creed, color, national origin, or religious beliefs. Special classes are even available for those with physical handicaps.